Take the advice of the professionals and perfect your trail ride. 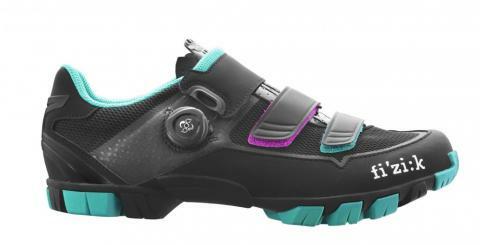 The Fizik M6B Women's MTB SPD Shoes have been developed with the advice of those at the very top of the sport to boost your performance on the bike. Using advanced technologies the M6B Women’s MTB SPD Shoes put you at the top of your game when the session requires perfect flow. Comfort, resistance and power have all been promoted in a lightweight fit to make these impressive shoes capable of any type of mountain biking scenario. Featuring the Boa L5 Bridge closure system, comfort is customised for the perfect balance while the tough Microtex hook and loop straps hold the foot in place. For the ultimate power transfer, tough rubber outsoles combine with carbon reinforced nylon midsoles to enhance stiffness and make that mountain climb easier than ever. Mirror the ones you aspire to be with these top of the range shoes.